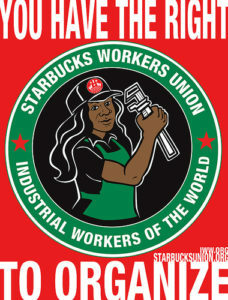 It’s been one year since Hannah was fired from Starbucks and denied unemployment. Hannah filed an Unfair Labor Practice lawsuit which was determined to have merit and sufficient evidence of a WRONGLY TERMINATED EMPLOYEE. She settled out of court, which meant that the concerted activity charge was dropped, and that Starbucks was no longer required to post notice of the charges in stores. Hannah was a Starbucks worker between licensed and corporate stores for 5 years as a ‘shift lead,’ and in that role supervised Health & Safety standards. She discovered that the first aid kit didn’t have its mandatory bandages, and also learned that fellow coworkers were not receiving proper legally required breaks. She voiced these safety and legal concerns to management. December 15, 2010: With no prior verbal or written warning, she was pulled aside by her manager and told she was being investigated for ‘fraud’ and suspended ‘until further notice.’ A short day later Hannah was fired via telephone and told to call 1-800-STARBUC if she had questions. January 2011: Hannah files for unemployment, is denied, appeals, and is denied again. February 2011: Hannah files an Unfair Labor Practice lawsuit, which is reviewed by the National Labor Relations Board, and is determined to have merit and sufficient evidence of a wrongly terminated employee acting in legal concerted activity. June 2011: Starbucks settles out of court with Hannah to drop the concerted activity charge and pay some lost back wages. However, due to settling with the company, the charge would no longer be required to be posted and read aloud in the stores. 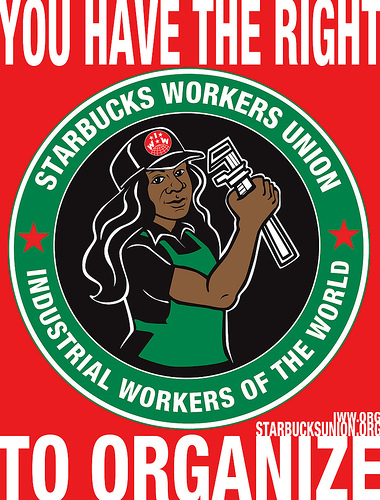 JOIN US in front of the Starbucks where Hannah worked to let everyone know what happened, and that it is LEGAL to discuss workplace issues with coworkers. Know your rights! Know what to do and who to contact when you are bullied on the job!